The things that make a Volvo a Volvo just seem to work better in a vehicle designed for family-oriented, all-purpose transportation. The Volvo XC90 is strong on safety, comfort and functionality, and we consider it one of the most successful vehicles Volvo builds. In the growing-family scheme, the XC90 has it all. Its styling is appealing, without shouting family-mobile. It seats up to seven passengers, with more cargo space than nearly all its competitors and features that allow quick, easy tailoring for cargo, gear or people. The XC90 is not the sportiest vehicle among luxury-class SUVs, but it handles well on city streets and highways. It rides very comfortably and it's easy to park. Any of the three XC90 models can tow just about anything the typical family is likely to pull along. The standard 235-hp six-cylinder engine that Volvo introduced last year is up to all the demands of daily driving and delivers the best value, in our view. It's smoother, more powerful and more sophisticated than the tried-and-true turbocharged five-cylinder it replaced, and delivers comparable EPA mileage ratings The upgrade 311-hp V8 adds a bit of excitement for those who put a premium on quick acceleration. In addition to the new base-level straight-six, Volvo freshened the XC90 last year with a restyled grille, bumpers and lights. Also new was Volvo's optional BLIS system, which uses cameras to search a large area on either side of the vehicle, and warns the driver if there might be an approaching vehicle not visible in the XC90's mirrors. For 2008, Volvo has made much of the content of last year's Touring Package standard with the V8 engine. And last year's Sport Package has been promoted to a separate trim level. Volvo's fulltime all-wheel-drive system works smoothly in the daily grind without any penalty in EPA fuel economy, and it's truly welcome when the weather gets foul or the road surface gets rough. Yet buyers who don't really need all-wheel-drive capability can choose an XC90 with front-wheel drive. Volvo's reputation for safety engineering is deserved. Maybe more than anyone, Volvo devotes impressive resources and manpower to improve occupant protection. The XC90 offers the full array of active and passive safety features, including a Roll Stability Control system designed to keep the XC90 from rolling over, and a rollover protection system intended to shield occupants in the extremely unlikely event that a rollover actually occurs. Less obvious are features like a roof structure fashioned from high-strength steel, or a lower front crossmember engineered to inflict less damage on small vehicles if an accident occurs. It may be the safest SUV on the road; it's certainly one we'd feel reassured seeing our loved ones drive. The XC90 is not inexpensive, but comes well-equipped, with the standard engine and all-wheel drive, for well under $40,000. Luxury-class shoppers who put a premium on comfort, safety and value should find happiness here. The 2008 Volvo XC90 is available with a six-cylinder or V8 engine. Both come with a six-speed automatic transmission. All-wheel drive (AWD) is standard with the V8 and optional ($1,850) with the six. The base XC90 3.2 ($36,210) comes with fabric upholstery, but standard features are otherwise premium grade, including an eight-way power driver's seat with memory; a 160-watt, eight-speaker stereo with CD/ MP3 and auxiliary jack; dual-zone automatic climate control; cruise control; trip computer; power windows, locks and mirrors; auto-dimming interior mirror; and 235/65R17 tires on 17-inch alloy wheels. Option packages bring the XC90 3.2's features up to par with the V8 model, minus the V8 engine. The Premium Package ($2,995) includes leather seating; a power front passenger seat; power moonroof; and a 6-CD changer. The Versatility Package ($2,250) can be added to the premium package and includes the third-row seat, rear air conditioning, a built-in second-row child booster seat and self-leveling rear suspension. The seven-passenger XC90 V8 ($48,505) is powered by a 4.4-liter V8 developed to Volvo specifications by Yamaha, the Japanese motorcycle builder and auto engine specialist. The V8 generates 311 horsepower and 325 pound-feet of torque, with standard all-wheel drive. In addition to a two-place third seat with rear air conditioning, the V8 adds leather upholstery, an eight-way power front passenger seat, a six-CD changer, a power moonroof, and speed-sensitive power steering. Additionally, many items from the discontinued Touring Package have been made standard on the V8 for 2008, including 235/60R18 tires on 18-inch alloy wheels; Sapeli wood inlays on the dash, gearshift knob and steering wheel; and additional bright exterior trim. Options for the V8 include a 12-speaker, 650-watt Dynaudio surround-sound system with Dolby Pro-Logic II and Sirius satellite radio ($1,400); and the new Executive Package ($1,995), which upgrades to premium soft leather, premium floor mats, and 255/50R19 tires on 19-inch alloy wheels. The XC90 V8 Sport ($49,870) promises more athletic handling, with firmer springs, shocks, and stabilizer bars; faster-ratio steering; and low-profile 255/50R19 tires on 19-inch alloy wheels. The Sport also upgrades to unique Calcite leather upholstery and aluminum rather than wood interior trim, while deleting some of the standard V8's exterior jewelry. A Technology Package ($2,295) adds bi-xenon headlamps with automatic level adjustment, plus the high-zoot Dynaudio stereo. All three models can be equipped with a Climate Package ($675), with heated seats, headlight washers and rain-sensing wipers; and/or a Convenience Package ($1,295) that adds rear park assist, power retractable side mirrors, a compass in the inside rearview mirror, power rear door child safety locks, and Volvo's Interior Air Quality System (IAQS). Stand-alone options include a navigation system ($2,120); a rear-seat DVD system with two headrest-mounted seven-inch color screens ($1,800); 18-inch alloy wheels, with chrome ($1,550) or without ($750); Active Bi-Xenon headlights ($800); a wood-rimmed steering wheel ($325); and metallic paint ($475-625). Also available is Volvo's blind-spot monitoring system, or BLIS ($695). BLIS uses cameras to monitor an area measuring 10 feet by 31 feet on either side of the car, which is often not covered by the side mirrors, and reports the presence of another vehicle in the blind spots with a prominent warning light in the appropriate mirror. Standard safety features make the XC90 is one of the best equipped sport-utilities on the market. Standard safety features include dual-stage front impact and side-impact airbags for front passengers, and curtain type head protection airbags for all outboard seats. The XC90 was one the first SUVs equipped with a rollover protection system, which senses an impending vehicle rollover, tightens the seatbelts and deploys the curtain airbags. The seats feature Volvo's Whiplash Protection System, which moves them back and downward if the vehicle is hit from behind, reducing neck snap. Safety features intended to help drivers avoid collisions to begin with include advanced four-channel antilock brakes, an electronic stability program to help manage skids, and Roll Stability Control, which uses a gyroscopic sensor to reduce the possibility of a rollover by applying brakes and modulating engine power. The Volvo XC90 looks like what it is: a fairly large sport-utility vehicle designed and built by Volvo. If that sounds a bit ridiculous, allow us to explain. The XC90 has the rugged, adventurous, substantial look buyers probably expect in an SUV, but it's also very clearly a Volvo, even without the badges. The XC90 was freshened last year with some subtle styling changes, which carry over on the 2008 models. These include a new grille, bumpers and taillights, and the overall effect is actually a bit more conservative. The grille looks shorter, so the step up from the contoured fenders, which flow Volvo-style back from the headlight clusters, seems less prominent or pronounced than before. The tweaks don't substantially change the XC90's character or overall effect. In the rear-view mirror of cars ahead, this SUV still looks a bit like an old convertible with its top puffing up in the air stream. Its hood is unusual among contemporary vehicles. Rather than the more familiar power bulge, the XC90 hood has a horse-shoe shaped crease with the area within that crease pressed lower than the surrounding edge. In other words, this bulge is reversed. The overall angularity says Volvo. In side view, the XC90's roofline rakes upward dramatically from the windshield to a high horizontal plane, with the arc of the top echoed by the curve of the roof rails. A high beltline enhances to the typical visual image of a tall SUV, and creates the feeling of a protective cocoon inside. The rear glass is inclined toward the front of the vehicle, which shortens the roofline a bit and tidies the XC90's profile. The XC90's basic stance gives it a well-planted look and promotes handling stability. Its wheelbase is long, but the overhangs are short, so the body doesn't extend very far past the wheels. It has a wide track as well. And despite its height, the XC90 has a lower center of gravity than many SUVs. The taillights may have been reshaped last year, but they remain as huge as ever. The idea, in Volvo's safety scheme, is to reduce the chance of getting creamed from behind by some half-asleep driver. The same thinking applies to the back-up lights. They seem as bright as the roof lights on an a Baja pickup, making it less likely to back into something at night. Two other exterior features may enhance safety. All XC90s feature side mirrors with integrated LCD turn signals to warn drivers in your blind spot of your intensions. These are probably more valuable to the XC90 driver than to other motorists, because they make it nearly impossible to forget that a turn signal is operating. All models are also available with Active Bi-Xenon headlights. In addition to generating brighter light, these headlights swivel up to 15 degrees off center in the direction of travel to better light up the turns. The XC90's rear hatch has two sections, with a larger, upper glass portion that swings up and a lower, steel gate that drops down. The split-line between is about waste high, so if you're just stowing the groceries or dry cleaning, you might not need to drop the tailgate. Larger objects require opening both halves, so this clamshell hatch has its strength and weaknesses. The disadvantage is that two gates can make more work. On the plus side, the short tailgate lifts and closes easily, and the upper liftgate is less likely to bonk you or someone else on the head when you raise or lower it. Liftgates on some SUVs are hard to raise due to their weight and the angles involved, but that's not the case here. The little tailgate also keeps groceries and other cargo from rolling out when you open the hatch. The standard V8 model is easier to spot for 2008, with new bright trim added to the lights, mirrors, and C-pillar, in addition to the color-coordinated fender extensions and silver (instead of standard black) roof rails that carry over from last year. (And then of course there's the V8 badge in the grille.) The more subtle V8 Sport does without the new brightwork, but shares the standard V8's fender extensions and silver roof rails. Very sharp-eyed enthusiasts might notice the Sport model's unique front bumper trim. The Volvo XC90 seats five to seven passengers depending on the seating configuration. It's quiet, comfortable, and above all, roomy. By mounting its engine sideways across the chassis, Volvo has created a cabin with the space and flexibility of a minivan inside a relatively compact exterior. The materials and finish inside are very good, and functionality rates almost as high, despite some Volvo-specific quirks. The XC90 makes an excellent vehicle for families with two or more children growing into their teens. Standard interior trim is a mix of brushed aluminum around the door pulls, wood trim on the center console and dark, matte-finish plastic behind the switches in the center stack. Volvo steering wheels have some of the chubbiest rims in the business, and they're so thick that drivers with small hands might find them a bit too hefty. The steering wheel is covered in rich, grippy leather. It requires a small step up to slide into the XC90's driver's seat, though well-placed grab handles make getting in easier. Those aluminum door pulls are not so effective, however. They're fairly narrow, and seem to be made for people with little hands (in contrast to the fat steering wheel rim). The front bucket seats are comfortable, with good, adjustable lumbar support. While Volvo leather is some of the best around, the fabric upholstery in the base XC90 3.2 is soft and attractive. Headroom is exceptional, thanks to the high roofline, and the big windows create a feeling of space, with excellent forward visibility. Unfortunately, Volvo's emphasis on safety has drawbacks in this regard. Large, tall headrests restrict forward visibility for passengers in the second- and third-row seats. More significantly, the headrests can reduce what the driver sees in the rearview mirror. Another minor annoyance is the perpetual reflection in the windshield from the big subwoofer in the top of the dash and the red button for the four-way flasher. The instrument panel is canted upward toward the windshield, creating a stronger cockpit effect than one finds in the typical sport-utility vehicle. The gauges are simple and easy to read. Window switches are on the doors, right near the fingertips when the driver's left arm lies on the armrest, requiring no hand or wrist contortion to operate. Other controls are concentrated in one of two spots: on easy-to-use stalks flanking the steering wheel, or in the stack rising from the center console. Here you'll find some of those Volvo quirks, which are neither good nor bad. They're just a bit different than the convention in most cars. The switches that direct airflow for the climate controls, for example, are fashioned with a now traditional Volvo icon that looks like a seated person set over the top. Push the person's feet and all air flows through the floor vents; push the head, and air flows toward the windshield. The audio controls are even more unusual, with a twisting knob that cycles through menus and a keypad that looks like telephone buttons. They all work quite well, once a user gains some familiarity, and nearly all are large and easy to locate, even at night. Seating and cargo arrangements inside the XC90 are enormously versatile, allowing 64 different configurations, including six of the seven seats folded flat, including the front passenger seat. Equally impressive is the ease with which the seats slide, fold, change and vanish. The second-row bench seat is split 40/20/40, and each section slides forward independently, adjusting the amount of legroom for the second and third rows. Headrests don't have to be removed when the seats are folded flat. The console between the front seats can be easily removed, allowing the center section of the second row to slide way forward between and just behind the front buckets. With the optional integrated booster cushion for that seat, tending to a toddler has never been easier. The two-belt third seat is standard on the XC90 V8 and optional on the 3.2. Getting into the third row is easier than it is in many SUVs, because sliding and flipping the second-row seats is a breeze. Of course, with the second row positioned for adult-sized legs, there's only enough leg room in the third row for kids. Still, for 10-year-olds the third row is a cozy and convenient little world all its own, with a storage console, cup holders, and separate climate controls and registers. Kids actually want to sit way back in the wayback. Headphone plugs are provided, meaning second- or third-row headphone users can listen to a CD while the front-seat occupants listen to the radio through the speakers. Given the XC90's overall family friendly design, an overall lack of storage for smaller items (particularly in front) seems more glaring. This is a gripe we often have with Volvos. The door pockets are narrow and the small center console compartment is slim and difficult to access. If you slide a few CDs in the slots, there's no more room at all. Bigger items are another story, because the XC90 can carry more stuff than most of its competitors. With all six passenger seats folded down, it offers 93.2 cubic feet of cargo space, or more than what's available in the Mercedes M-Class (72.4 cubic feet), BMW X5 (61.8), Acura MDX (83.5), Lexus RX 330 (84.7), Cadillac SRX (69.5) and Infiniti FX (64.5). Even with all three rows of seats in place, there's room in the Volvo for two or three stacked duffel bags behind the third row. The Volvo XC90 is one of the most appealing vehicles Volvo builds. Beyond its family friendly design, functionality and flexible seating/cargo configurations, it's generally a pleasant vehicle to drive. It isn't particularly bulky or even hard to park, nor mundane in a people-mover, family wagon fashion. Many of the driving characteristics common to Volvos, including a hefty, solid demeanor, deliberate steering and a soft brake pedal, seem to go better in this sport-utility than in a sport sedan. We think the base XC90 3.2 is the best deal. Its naturally aspirated (that is, non-turbo) inline-six lacks the immediate rush of acceleration generated by the previous (pre-2007) turbocharged five-cylinder, but peak horsepower is increased, and it's far more flexible. The torque flows more evenly, meaning there is more even acceleration at any engine speed, and the six feels much smoother in all circumstances, from idle to full-throttle acceleration. Forward momentum is further improved by the responsive six-speed automatic transmission that arrived with the new engine. It includes a Geartronic manual shift feature that lets the driver shuttle up and down through the gears if he or she is feeling racy; this is sometimes useful to reduce shifting in hilly terrain. Perhaps best of all, the more powerful six-cylinder/six-speed automatic combination gives up very little fuel efficiency to the old five-cylinder/five-speed. That combination was rated 17/23 mpg city/highway by the EPA test procedure in use at that time, but because of the newer and ostensibly more realistic testing the EPA uses now, the government agency has since downgraded the turbo-five's rating to 15/21. That's the apples-to-apples score that needs to be compared to the new six-cylinder's current rating of 14/20 mpg, city/highway. We averaged just over 20 miles per gallon in a mix of city and freeway driving, and we'd call that pretty good in an all-wheel-drive vehicle as heavy as the XC90. We recommend the optional all-wheel drive for owners in the Snow Belt, and in climates where it rains a lot. So equipped, the XC90 3.2 will still retail for well under $40,000. The all-wheel-drive system operates seamlessly, and the driver will almost never know when it's working. In normal, good-traction conditions, 95 percent of the engine's power goes to the front wheels. If those wheels lose traction, a multi-plate clutch begins routing power to the rear, to a maximum split of 65 percent to the back tires. This frontward bias leaves the XC90 with a default understeer condition. (Understeer is where the front tires start losing grip and sliding before the rear tires do.) This push is much easier to handle than a skittish rear end, because a driver's natural instinct is to slow down, and that basically solves the problem. 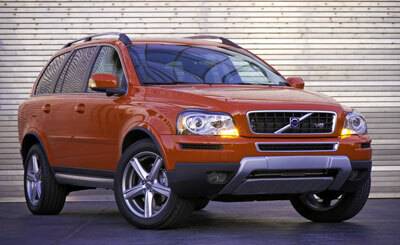 The XC90's optional V8 engine was developed for the U.S. market, where about 30 percent of all SUVs are sold with V8s. Because Volvo has no history with V8s, it worked with Yamaha to develop one compact enough to fit in the XC90's engine bay. With the V8, Volvo also made some changes in the all-wheel-drive system. In normal circumstances, the V8 system sends more power to the rear wheels for better take off from a standing start, and it incorporates a fast-reacting Instant Traction system to minimize wheel spin. We spent several hours in the XC90 V8 and found it well-suited to the sort of driving done by many American SUV owners. On one hand, we enjoyed its quick acceleration and no-sweat passing capability; although it doesn't turn the XC90 into a lightning-quick hot rod. It does increase the XC90's tow rating by nearly 1,000 pounds (4,960, vs. 3,970), and probably makes towing lighter loads easier. But unless you absolutely need that towing capacity, we'd call the V8 a luxury in this vehicle, rather than a must-have piece of hardware. Regardless of which engine was chosen, the XC90's silky smooth feeling at 80 mph impressed us. Its chassis closely follows the design of Volvo's Cross Country wagon, though it's wider and the components are beefier. The XC90 handles bumpy roads with dips and gullies well, without crashing loudly or bottoming when driven hard. It doesn't offer the sporty handling of a BMW X5 or Infiniti FX35, but some of us prefer it. The Volvo's power rack-and-pinion steering is on the heavy side, and not particularly quick in sharp curves yet the XC90 doesn't wallow or sway excessively under hard cornering. The electronic stability system, called DSTC, stepped in a few times when we were thrashing down a particularly ornery road, and applied the brakes at one wheel without cutting engine power. It worked as intended, and helped keep the XC90 going where we intended while driving at rate few owners will care to undertake. Ride quality in the XC90 is very good, and stiff at the wheels but not in the cabin. It doesn't exactly absorb the ridges and bumps, because you feel the suspension working over them, but it doesn't transfer any harshness to the arms or seat of the pants, either. Speed bumps in particular are interesting: It's as if the suspension challenges them and hammers back, protecting us from jouncing even when we hit them at 15 mph. The brake pedal in the XC90 can feel a little soft until the driver gets familiar. But once that occurs, that driver can stop the XC90 smoothly and progressively, and very quickly if necessary, with no drama. Substantially sized brakes are one reason for the V8's substantial maximum towing capacity of nearly 5000 pounds, which is more than enough for family duty such as towing a camper, ATVs or a couple of watercraft. The Volvo XC90 packs a lot of space into a good-looking, manageably sized vehicle. It's better than most competitors for hauling children around, with superior cargo and seating flexibility, and it's loaded with Volvo's trademark safety technology. It's available with fuel-saving front-wheel drive if a buyer doesn't really need all-wheel-drive capability. The upgrade XC90 V8 is appealing and invigorating, but the base XC90 3.2 six-cylinder is better than adequate for nearly all purposes, and it represents a much better value. NewCarTestDrive.com correspondent Sam Moses reported from the Columbia River Gorge, with Larry Edsall in Gothenburg, Sweden, Mitch McCullough in Los Angeles, and J.P. Vettraino in Detroit. Head/hip/leg room, f: 39.7/55.4/41.0 in. Head/hip/leg room, m: 38.4/54.1/34.6 in. Head/hip/leg room, r: 35.5/44.5/30.1 in. Cargo volume: 93.2 cu. ft.